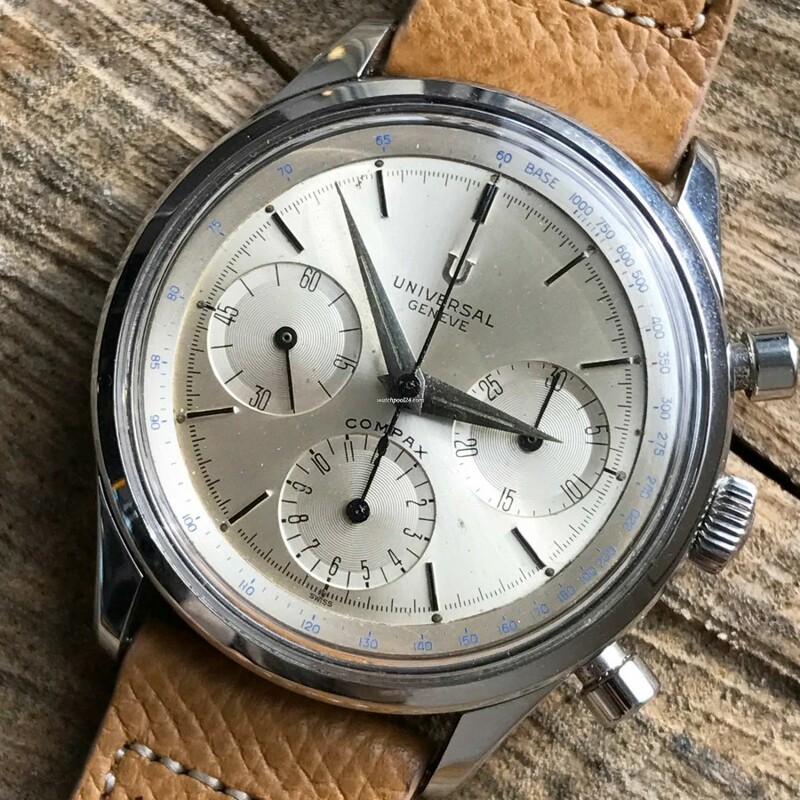 This 1960s Universal Genève Compax with UG Caliber 130 (Valjoux 72) movement and the "oversized" case with a diameter of 38mm is very special and extremely rare. Universal Genève watches typically came in sizes between 34 and 36mm. This watch is a rarity with its 38mm steel case. The brushed silver dial with baton markers, blue Tachymeter scale and Dauphine hands gives the chronograph an elegant flair. The dial is in a mint condition with patina spotting, which wonderfully reflect the natural aging process of the watch. All tritium lume dots are intact except those at 1 and 3 o'clock. The sharp case and clearly readable reference- and serial number engravings on its back prove an unpolished case. The legendary Valjoux 72 movement is the heart of this magnificent chronograph. The watch was checked and works properly in all functions. All in all: a rare, sporty-elegant watch, very sought after by vintage watch collectors.